I painted this for the Romantics at heart because I am one too. The Courtship, reminds us on how beautiful and innocent love is. 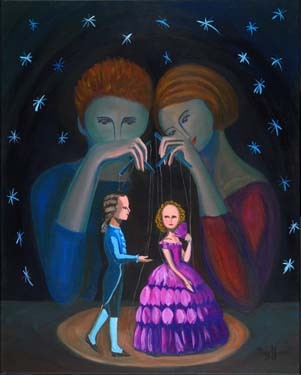 In this painting instead of using words to express their love for each other, the couple utilizes their marionettes to speak their hearts, after all action does speak louder than words and the stars in the background symbolize their destiny.